This anti-pry, water-resistant fingerprint lock offers all the protection of a rugged traditional version, but with added intelligence. Tapplock unlocks in less than a second and in three different ways. Program it to read fingerprints, create a Morse code sequence to tap on the power button, or unlock it directly from the companion app. Its adaptive algorithm gets smarter and more accurate with each time you use it. And with just a quick, two-hour charge, its battery can last for a year. Use the companion app to check the battery life, the entry log, and to grant or revoke access to individuals whenever you like (it stores up to 500 fingerprints in its library). Now unlocking a secure lock is even easier, without sacrificing safety. Hello everyone! I'm proud to introduce Tapplock to The Grommet. I'd be happy to answer any questions you have! Sounds fabulous...any chance for pricing to go down? As I can see that the price is prohibitive for all those teenagers out there who want to lock their books up! @Cindy Hi Cindy! At this point, Tapplock One will stay at this price point due to materials and manufacture costs. We will definitely take your feedback into consideration! @Winnie I was wondering if withstands cold freezing temps. this would be great for our employees in the winter instead of fumbling with keys! @Patrica Hi Tricia! Tapplock operates in 14°F - 104°F. You can also add up to 500 fingerprints for multiple users. Does this work outdoors and will be able to handle weather and temperature extremes? Is there a manual way to open if the battery in the lock is dead? @Kevin Hi Kevin! Tapplock operates in 14°F - 104°F. It is also IP-66 waterproof and UV proof. There is no manual way to open the lock. The battery is rechargeable and each charge lasts one year. When your Tapplock is below 10% the LED light will flash red. In case the battery does run out, you can use any portable USB charger. Hi - When unlocking from the companion app, do you have to be within bluetooth range, or could you open it via the internet from far away? If so, how does this work -- does it have to connect to a wireless router? Thinking of being able to allow access for work people or emergencies. Thanks. @Thomas Hi Thomas! To use the Bluetooth Unlocking feature you will have to be within 1m range of your Tapplock and Mobile Device. We do have a feature called, Shared Access, where you are able to remotely share access without being near your Tapplock. You can Share Access on a one-time or permanent basis in a matter of minutes! After watching this video -I was searching my brain for something to use it on. I so badly want to replace my Yale locks as it weds me to a security system I can't stand. But I love coming in and out of my house without a key. Please consider making this system for doors. @Kris Benjamin Hi Kris! I like your thinking. You'll be happy to know, door locks are coming soon! I'm wondering what makes your lock better than other Bluetooth locks out there. Especially at this price point. Thank you. @Jody Hi Jody! 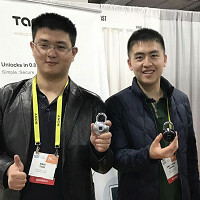 What separates Tapplock One from our competitors are the following: Tapplock is the first smart fingerprint padlock that unlocks in 0.8 seconds. 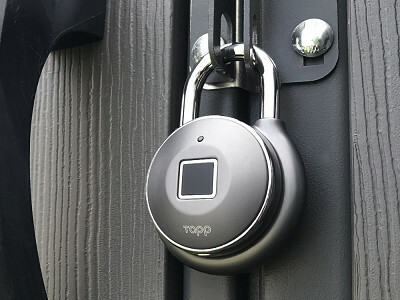 Tapplock also has the capabilities of being a Bluetooth lock. We also have a Shared Access feature that allows Tapplock users to remotely share access to friends/family/colleagues. Tapplock can store up to 500 fingerprints for multiple users. It runs on a rechargeable battery that lasts a year when fully charged, approximating for 3,500 unlocks. It can also be used in outdoor environments as Tapplock operates in 14°F-104°F temperatures. It is IP-66 water-proof and is UV proof. I would like to use this on my gate. Will it read a fingerprint if it is raining & and the sensor is wet? @Julie Hi Julie! You can certainly use it on your gate. If it is raining, you would have to wipe the sensor so that it is not wet. Alternatively, you can use the Bluetooth Unlocking feature or the Morse-Code feature. @Gloria Ok, just to clarify, if you want to grant shared access, can they download the companion app and open from their phone also or is it just granting access with your phone and they use fingerprint or the Morse-Code? The 14 deg F temp limit would make this problematic in many areas of the frozen North where winter temperatures can often drop much lower than that. Is a low-temp version possible? @Margaret thanks for your feedback, Margaret! At this time we don't have plans for a low-temp version. However, I can pass your feedback to our development team. We live in an area where winter temps go below 14*F... can the lock be left out during such times and will it function normally when temps return to within its limits? @Anna Hi Anna! We don't recommend using Tapplock when temperatures will go below our tested threshold. You may experience issues with your unit when the temperature returns to its tested limits. This anti-pry, water-resistant fingerprint lock offers all the protection of a rugged traditional version, but with added intelligence. Tapplock unlocks in less than a second and in three different ways. Program it to read fingerprints, create a Morse code sequence to tap on the power button, or unlock it directly from the companion app. Its adaptive algorithm gets smarter and more accurate with each time you use it. And with just a quick, two-hour charge, its battery can last for a year. Use the companion app to check the battery life, the entry log, and to grant or revoke access to individuals whenever you like (it stores up to 500 fingerprints in its library).